Have you ever considered growing lavender? Lavender is perhaps one of the most well-known and widely used herb in the world. It’s also a gardener’s dream, with its lovely foliage and fragrant flowers. Bring the magic of lavender fields into your home and garden by growing it yourself. It may seem intimidating, but lavender is actually an incredibly forgiving plant, as long as you give it a little care and attention. Plus, it can be used to reduce stress, fight anxiety, and ease headaches. Place it in your bedroom for a spa-like feel and to improve sleep. Of all the different kinds of lavender out there, English Lavender (Lavandula Angustifolia) is one of the hardiest choices. It’s also the most commonly planted. Munstead: This variety is rather compact, making ideal for indoor growing. It has a high heat tolerance, with some hybrid varieties also resistant to the cold. Its foliage is bright green with bluish flowers. Hidcote: This smallish variety is a little taller and wider than Munstead, but its leaves are grayer and its flowers have a lovely deep purple color. Hidcote is one of the most aromatic varieties of lavender, easily filling an entire room with its lovely scent. Imperial Gem: This type has bright silver leaves and stout purple flowers, making it ideal as a centerpiece on a table or as a bouquet. Twickel Purple: This variety has a strong, bright scent, long purple flowers, and gray/ green foliage. It’s a great option if you’re looking for a plant with a little height. Mini Blue: This is one of the smallest, making it great for small rectangular flower pots. It also yields many flowers, so it’s perfect for brightening up your space and filling it with life. Not surprisingly, it loves 8 hours of full sun, great drainage and good air circulation. Once matured, it is even drought tolerant. Hence, it’s important to avoid wetting its foliage by letting the soil dry out between watering and only watering the plant at its base. And so, it’s a good idea to plant lavender in a large flowerpot with a drainage hole and plenty of loose gravel at the bottom. This will improve air flow to the roots and keep them from rotting. The plant itself may seem quite small, but lavender has a large root system and will feel suffocated in a small pot. 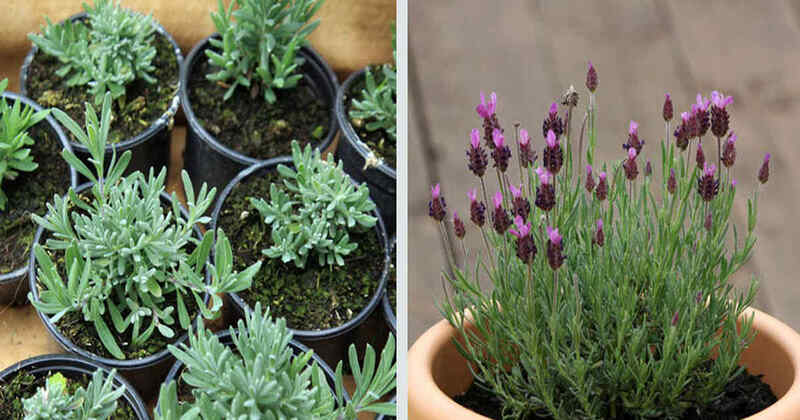 As far as soil goes, lavender prefers a mix of peat, vermiculite, and perlite, but it will tolerate regular potting soil. Spoil it by placing mulch at the base of the plant to create a barrier between its foliage and freshly watered soil. Lavender doesn’t require a lot of care, but it does require yearly pruning. Since the plant is a semi-shrub, it will start to get woody over time. A little wood is okay, but too much will kill your plant. And so, pinch off the tips of a new plant as it grows and after it blooms to encourage new shoots and shape. Once it’s about a year-and-a-half old, prune it yearly, cutting down 2/3rds of the plant. A good rule of thumb is to prune down to the 3rd node above the old wood. Lavender will go through blooming periods, meaning that it won’t hold its flowers year-long. However, the plant does have fragrant foliage, so picking a stronger-scented plant will ensure that you can still enjoy the lovely smell of lavender even when your plant is not in bloom. On the other hand, if you’re prone to scent-related headaches, pick a softer-scented variety. Lavender can smell very strong when in bloom, which can be unpleasant for people with a sensitive sense of smell. Lastly, lavender is toxic to cats and dogs, so make sure to place it out of the reach of reach of children and pets. There you have it! Everything you need to know for growing lavender indoors and getting the benefits of lavender every time you come home.